This time the mattress selected on this single adjustable bed is a Reflex foam mattress (£40 more) which is made from high density foam, this provides comfort and offers support to people who are suffering from back problems. This is an ideal mattress because even it is in raised position the mattress always follows the shape of the bed in a free manner. The foam is available in different densities for various user weights for a relaxing night sleep. As you will notice that in the picture above, a headboard has been selected and attached to the adjustable bed. Option 1 single headboard that cost £70 on this single electric profiling bed. To aid you from sweating at night while sleeping, which is a common problem with any type of mattresses, we can provide you with the Anti-perspiration pad for only £80.This Anti-perspiration pad increases the air flow between user and the mattress surface, therefore reducing sweating. Although no Drawer has been selected, a dovetailed drawer is available in the foot end. Again, the picture shown above is the Serena with the adjustable bed mechanism in the slightly raised position. The size of this bed is single 3’ width and 6’6” long. The colour is featured in ivory suedette. The material of this bed base is washable as we know that light colours are prone to marks so therefore, the cleanliness and neatness of the quality bed is maintained. 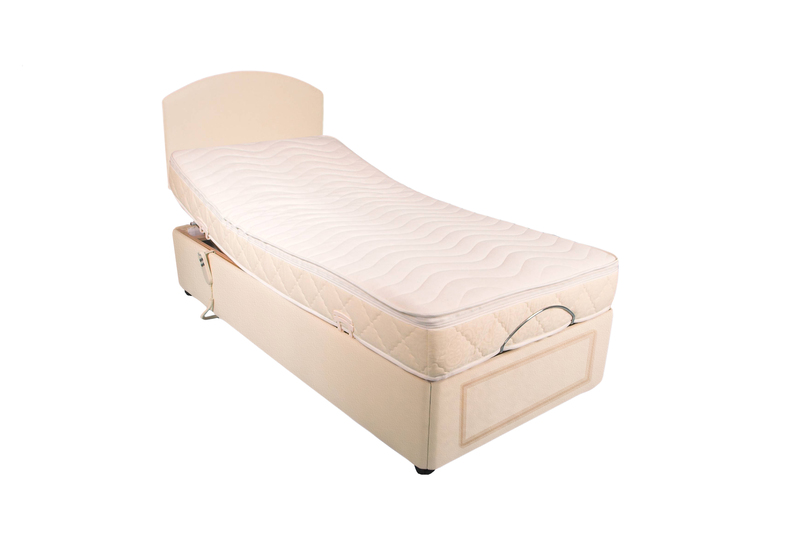 The same as with image 62, a reflex foam mattress has been used on this adjustable bed. It flexes and follows the shape of the body to make you more comfortable while sleeping. Once again, an optional upholstered headboard is shown which only costs £70. This can be seen when you Build a bed online. It is shown with additional accessories in this case the Solid Pine Dovetailed drawers in the foot end of the bed. The cost is only £60. Also you can have spare washable covers for only £79 each and 97% cotton elasticized jersey sheets which cost you £29 per sheet which fit the adjustable bed mattress nice and snug weather the mechanism is raised or flat. The retail price of this Serena single adjustable bed with Solid Pine Dovetailed drawers including the other accessories is £777. If you decide to let High & Dry Manufacturing Ltd deliver and install for you, there is a nominal charge of £50 or £100 depending on the location so please feel free to contact our freephone number to discuss the details with our consultants. If you would like to see more information on our adjustable beds simply visit our website www.bed-adjustable.co.uk Or drop by Back Care Beds showroom in Southsea Portsmouth for further details. This entry was posted on Saturday, October 8th, 2011 at 2:16 pm	and is filed under Adjustable Beds Trade Pages. You can follow any responses to this entry through the RSS 2.0 feed. You can leave a response, or trackback from your own site.